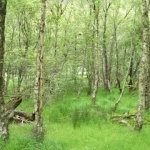 Welcome to the section of our website where we talkabout our travels. 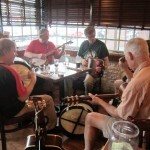 Many people who play Irish music not surprisingly enjoy traveling around the globe playing and learning about our music. 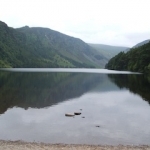 Whether it is to Irish music retreats, sessions in far away cities, or the ultimate – trips to mother Ireland herself, we want to share the stories of the people in our community who make these trips. We have called our page Shillelagh, which is an Irish walking stick made from blackthorn wood. 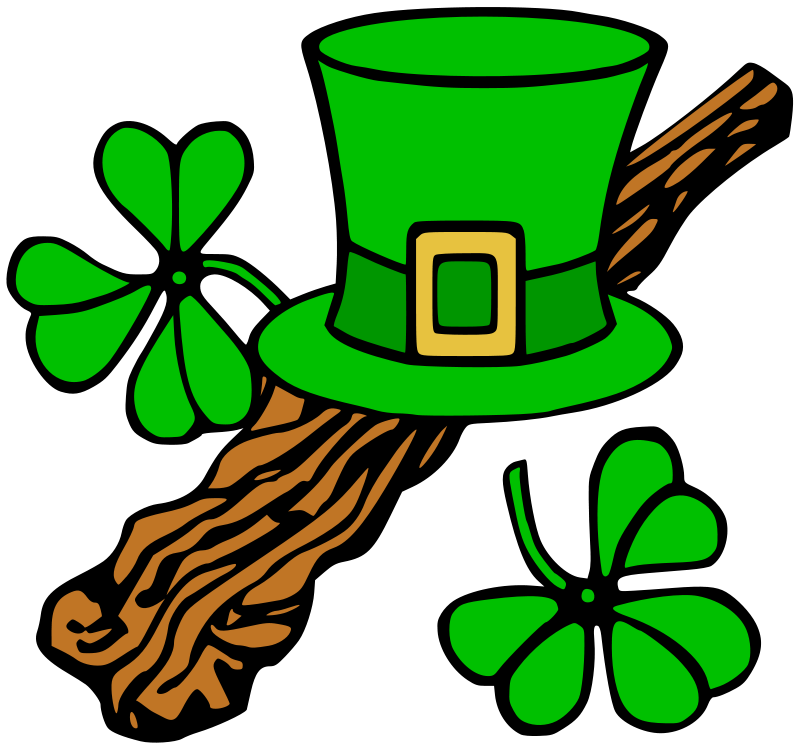 It is a common Irish symbol, and is used by many to assist them in their travels. A blackthorn walking stick has been a prize in Ireland for over 1200 years as the Siol Ealaigh people of County Wicklow developed them many centuries ago.The common song “Rocky Road to Dublin” features carrying a bag tied to a Shillelagh over ones shoulder. And, on an occasion or two, they have been known to give a good whack to someone who deserved it. But, our sessions forbid that unless of course you aren’t having fun! John Murphy, who leads the twice-monthly sessions in Denton, visited two sessions in Maryland this past year on visits to see his family. In July 2015 he played in a session at the Irish Penny Pub in Salisbury, on Maryland’s Eastern Shore. In March 2016 he played a session at Ryan’s Daughter Pub in Baltimore. The session at Ryan’s Daughter Pub was an intermediate-advanced session that often includes the great accordionist Billy McComiskey who wasn’t there when John visited because he was in New York to play a concert. 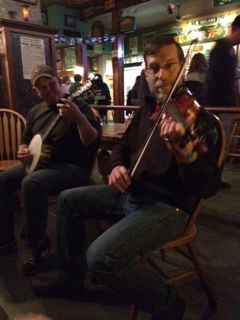 In February 2016 John played at a session at Pizza Italiain San Antonio while attending the Texas Music Educators Conference.In December 2016 he played at a session held during the Society for Ethnomusicology annual meeting in Austin at the conference hotel that was organized by the society’s Celtic Music special interest group. John states:“Playing at sessions while traveling is a great way to hear the repertoire played in other parts of the country.Typically, this is a mixture of familiar tunes and unfamiliar tunes and may include familiar tunes played in unfamiliar ways”. Prior to attending a session John searches thesession.org, to find the site of the pub that hosts a session, and confirms the session time with the pub by phone in advance to make sure it’s happening that day. “Several years in August I went to Portland, Oregon to attend a week long concertina school. 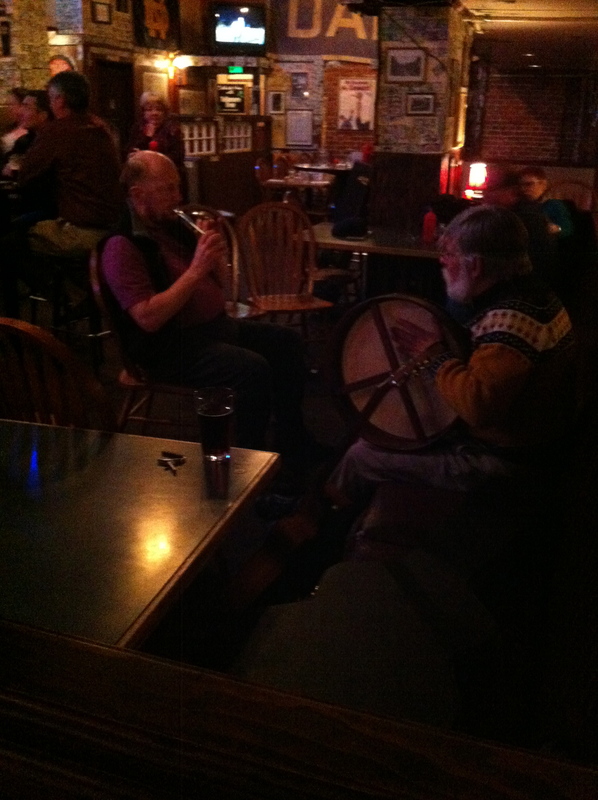 The first year I made an extra effort to attend a session at a local pub known as Kells Irish Restaurant and Pub. It did require an extra bit of research on the internet and a phone call, but I was able to create a fool-proof plan that actually worked. 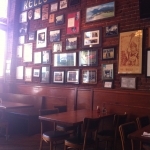 I took a train from the airport to downtown Portland and then used my iPhone GPS unit to locate Kells which was only 2 blocks away from the train station. On the way to Kells, I walked through an arts and crafts fair that is held every Saturday in downtown Portland. 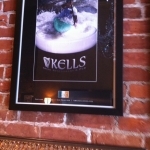 At Kells I introduced myself to the manager and had fish and chips for lunch (with of course the usual glass of Guinness). Once I had verified that they would indeed have a Traditional Irish session that evening I was free to roam about downtown Portland and enjoy the sunshine and 65 degree weather (in August) for the afternoon.I asked about all the dollar bills on the ceiling (see picture below) and was told that patrons would roll two quarters in a dollar bill and throw them at the ceiling where they would stick (magic?). Once a year the staff removes all the money and donates it to a local charity. As I walked about the streets of Portland I came upon a small gathering of people who were listening to a young man telling stories about how Portland got its name, and of the Shanghai trade that was a huge industry in the early days of Portland. 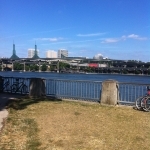 I decided to join this 2 hour walking tour and find out a little about Portland’s history. Turns out there were two main industries in Portland in the old days: bars and shipping. The young men would often go to the bars to get drunk and then after they passed out, were hauled away in covered wagons to the ships at dock a few blocks away. There they were thrown in the hold of the ship only to wake up the next day out at sea. It is said that most of these ships were on their way to Shanghai, China and so that is where the term shanghaied was invented. A very Unique Idea! I never thought of that. “When you go to Ireland, you certainly could drive all over the place in a car, or ride a bus, a train or a cab.Public transportation is great in Ireland.But you will not get to meet people and get to know the countryside unless you settle yourself in an area and stay for a while.My wife and I stayed in the Dublin area and found it to be delightful.The story about Dubliners having a gift of gab is not a myth. Native Dubliners – cabbies, shopkeepers, and people on the streets – are happy to direct you to their favorite places to see or to eat.Yes, I am taking a lead from Rachael Ray! 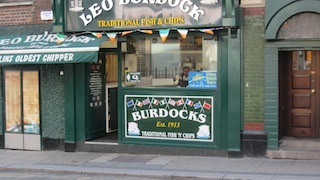 The one stop in Dublin that is a must is Burdocks Fish and Chips.Locals and tourists flock to this place. There is only enough room for 4-5 people to stand shoulder to shoulder like sardines.The fish comes in a single huge “plank” with a lot of chips wrapped up in brown paper in a huge parcel.But this is strictly a take-away place and there is no place on the premises to sit and eat.So you must take your meal and walk across the street to the ancient Christ Church, if you can stand to wait that long, for a picturesque setting and a place to sit down with your meal.There are nearby eateries with outside seating, but they will shoo you away if you make the mistake of sitting at one of their tables with that unmistakable package. No matter.You will love it. Gallagher’s Boxty House is in the Temple Bar area of Dublin.A boxty is not something I have had at any Irish pub in the USA.It is a traditional Irish pancake made out of potatoes.I have seen different sorts on the internet, but the ones at Gallaher’s are light and fluffy like a crepe, but with a creamy texture.Stuffed with chicken and a lovely sauce, it makes a huge meal.And I would vote their seafood chowder as the best I have had in my life so far. A note to Guinness fans, and I am one for sure; the Irish serve a great alternate to Guinness which they call Beamish. You must see the Oliver St. John Gogarty and its accommodations, restaurant and pub.On their menu is a Dublin Style Coddle.It is hard to explain this dish but it is like a white stew with potatoes, carrots and sausage.You got to try this with brown bread, it is heavenly.The atmosphere and music at this pub is all Irish traditional. They even have statues of little elves about the place. All I have talked about so far is food, but we did do other things.We also went to many places in and around Dublin such as St. Patrick’s Cathedral, the Guinness Storehouse, the Christ Church Cathedral, Dublin Castle, the Wicklow Mountains, the village of Howth, and other marvelous places. “This year I took a ‘guy vacation’ by myself to Wisconsin to spend a couple of days driving extremely fast around the Road America race course in Elkheart Lake, WI. Before I left, I did some internet searching and managed to track down an Irish session that would be held from 7:30 – 10:00pm the day after the racing ended. 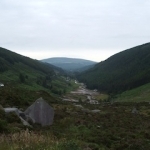 Even better, the session would be held in a 120 year old Irish guest house in a town only 10 minutes from the track! So I changed my lodging plans and booked a room at the ’52 Stafford’ in Plymouth, WI. The next morning I and my bodhran headed north. Seventeen hours and 1000 miles later I arrived at the hotel. It is the oldest continuously operating hotel in the state. It was built in 1889, has 19 rooms, and on Sundays is not really staffed, so my front door key and separate room key (not cards, real keys) were waiting for me in an envelope behind the planter on the front porch. No I’m not kidding. I walked inside and discovered a beautiful old hotel. 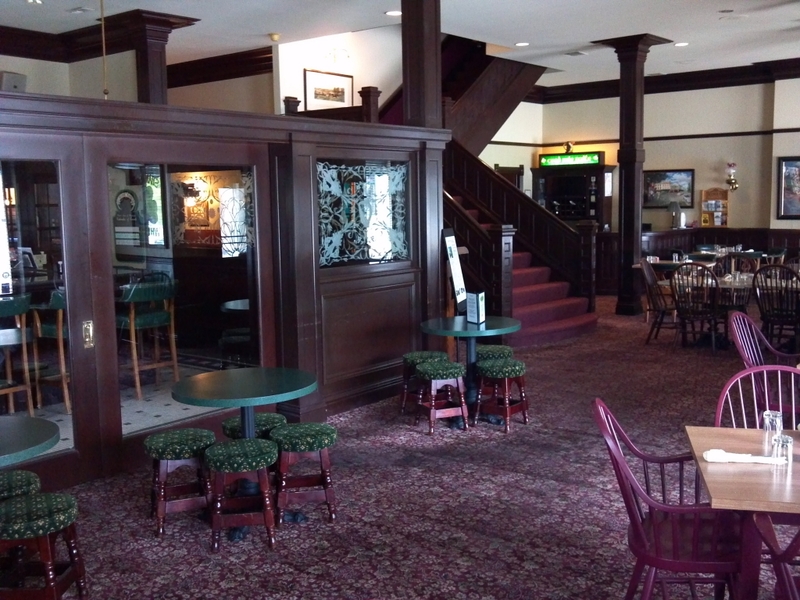 Stained glass, lots of Irish décour, heavy wooden doors and staircases, and a pub divided from the main lobby/restaurant by a wood-framed etched glass wall. Each night I ate in the restaurant at the hotel. I had the best Shepherd’s Pie I’ve ever tasted, as well as some excellent Guinness Stew. Finally, after two adrenaline-filled days of squealing tires and triple-digit speedometer readings, I sat in my room anxiously waiting for the first musicians to arrive. The owner was running the bar and promised to call me when the musicians arrived. It was past 7:30 and he was a little worried nobody would be there that night, because a big Irish festival was in Milwaukee, as well as an Irish music camp being held nearby. At 7:50 my phone rang. One person had arrived, and evidently the fiddle player would arrive by 8:30. So I took a deep breath, grabbed my drum case, and headed down the hall to the pub. Here I am, Playing in a session! 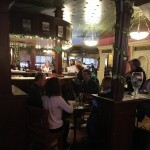 “After many searches on the Internet, I finally came up with a pub that had a session on Tuesday night of the vacation we were taking to Coeur d’ Alene, Idaho in October of 2012. 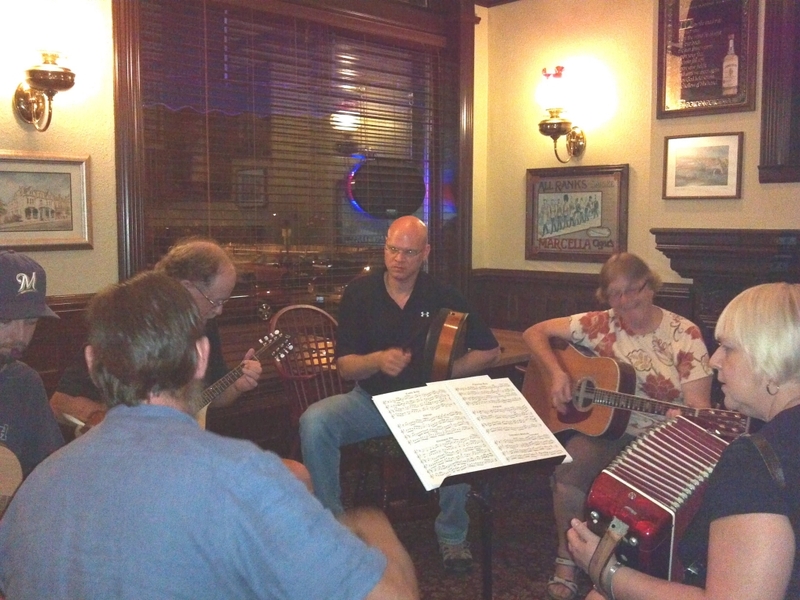 The session was held at a pub named O’Doherty’s Irish Grille in Spokane Washington (about an hours drive from where we were staying). It was 42 degrees and raining outside so it felt like Ireland (so they tell me). The food was the usual pub grub, but the Guinness was excellent as usual. We got there early so that we could get a good seat for this long awaited event. Barbara and I and her brother and sister ate our dinner and made plans to move to a better seat for the session. We noticed people gathering about 10 minutes before the scheduled event so the excitement kept building. 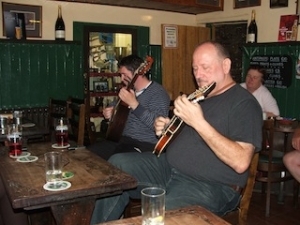 One man entered the pub with a guitar and went over to the place where the tables had been removed so that the session players could face one another. About 15 minutes later another man came in with a Bodhran and sat quietly talking to a young neophyte who want to learn to play the bodhran. Then, no other musicians appeared. We waited 30 minutes past the scheduled time and still no more musicians. We had another drink, and another drink. Note: That stuff on the walls is dollar bills that are signed with a patrons name and personal messages. I talked with each of the men with instruments for awhile and still no more musicians appeared. 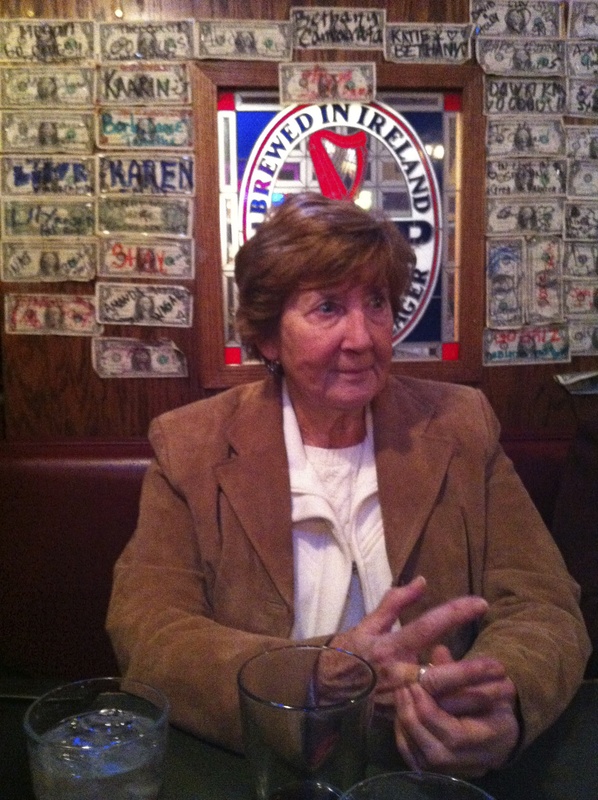 They had to stand on the bar and sing an Irish song in order to staple their bill to the wall. Finally in disappointment and desperation I took out my whistle, sat over with the bodhran player and we played tunes for about 30 minutes. Still, no other musicians appeared and the guitar player left without ever playing a note. The highlight of our session was when the young woman who had waited on us at dinner did a step dance to my rendition of Willie Coleman’s. After a few more tunes, we decided that this was all the session there would be for this cold, wet, Tuesday evening so we left somewhat disappointed. “Over the Thanksgiving week of 2013 I was in Seattle visiting family. 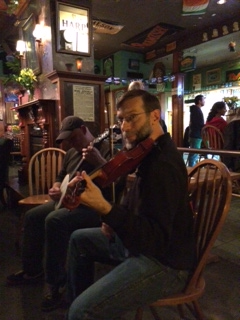 While practicing with my daughter’s violin one day I decided to look for a local traditional Irish session to join. A quick search of the Internet found a lively session scene in Seattle, with one very close to where I was staying happening the next night. I called the pub to make sure that it was going to be held during the Thanksgiving week and was told that it was. 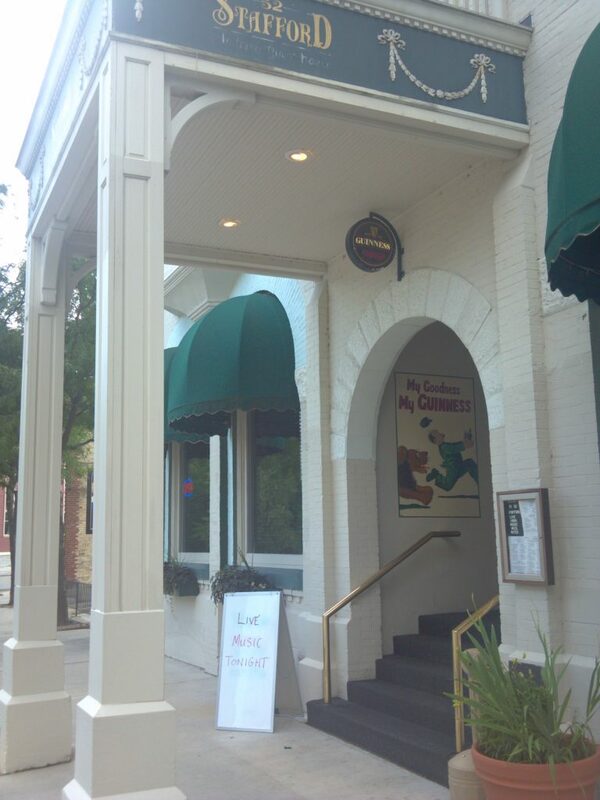 I arrived at Murphy’s Irish Pub right at the starting time of the session, instead of early as I had intended. A few people were playing some tunes that I knew, so I quickly pulled out my daughter’s fiddle and joined in before even sitting down. After the set was over, I introduced myself and found a seat near the session leaders. They graciously introduced me to the local players as they trickled in. Eventually we had four players on fiddle, two each on flute, guitar and banjo with one player of the Uilleann pipes who also played flute.Some doubled on other instruments including bodhran, penny whistle and concertina. 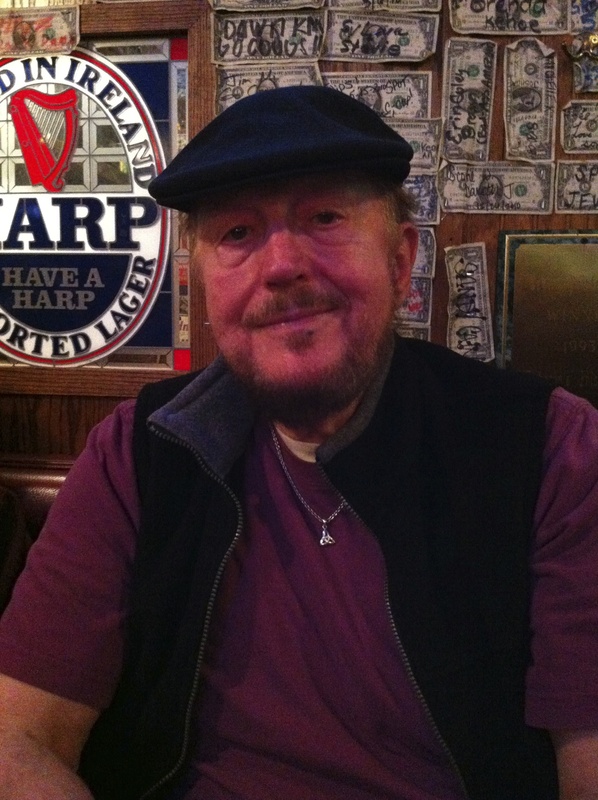 This session at Murphy’s followed a format that was very familiar and comforting. The players sat in a rough circle with some sections being two deep. Each player could choose a free drink from Murphy’s extensive beer menu. For the first two hours the playing was quite brisk, including many tunes that I was not familiar with. One guitarist flat-picked a few tunes up to speed on a twelve-string guitar!After the “official” two-hour period was over, the leaders left. I stayed with the smaller group, playing until nearly midnight. This group included some intermediate players who had not played much yet. We played many of the “chestnuts” and “war-horses” that we are all familiar with. This is not to say that intermediate or beginner players were shunned earlier in the evening. The leaders had particularly asked one fiddle player to start a tune, as he had not yet played, though he demurred. Two unexpected things happened. Early in the evening the Uilleann piper placed his wooden flute on a chair while he was playing the pipes. The flute was promptly knocked to the floor. The owner was quite concerned about his instrument, but did not find any cracks, though the light wasn’t bright enough to thoroughly check. Later, I started hearing what sounded like a tambourine to my left. When the set was over and I could look, I saw a young man sitting on a wooden box that he was banging on. I asked him what it was. He told me that it was a cajon (pronounced with an “h”sound in the middle) that he had added some type of rattle to. No one asked him to leave, but mercifully he soon started playing more quietly when he realized he didn’t understand the tunes. He packed it up after no more than 1/2 hour.